The obesity epidemic has spawned an unlimited array of quick-fix, rapid weight loss plans and unproven pharmaceuticals. Dangerous side effects and rebound weight gain has made the cure seem worse than the syndrome itself and left people uncertain where to turn. The only way to safely deal with the global obesity problem is to develop strategic therapeutic interventions using safe, natural supplements supported by credible research. 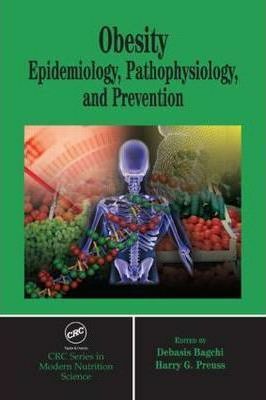 With contributions from pioneers and esteemed leaders in their respective fields Obesity: Epidemiology, Pathophysiology, and Prevention is a comprehensive resource covering a broad range of topics associated with obesity. Divided into eight sections, the text covers epidemiology and pathophysiology, correlating obesity with environmental estrogens, disordered eating, inflammatory responses, and endocrine disruption. Contributions also address neurobiology and neurotransmitters, leptin, ghrelin (the hunger hormone) and molecular genetics. The book devotes several chapters to obesity and its related degenerative diseases, drug development and adipose-targeted drugs, and the safety of obesity drugs. An expansive portion of the book considers natural, nutritional, and physical approaches to weight management. Taking an evidence based approach, it explores exercise, diet (including vegetarian and Atkin’s diets), gender differences, and caloric restriction, along with research on a wide range of functional foods, nutraceuticals, and natural supplements such as hydroxycitric acid, marine lipids, tea, chitosan, calcium, polyphenolic compounds, trivalent chromium, ephedra, and glucomannan. Special sections on the intricacies of childhood obesity and the benefits of bariatric surgery round out the array of information. With unparalleled depth of coverage, Obesity: Epidemiology, Pathophysiology, and Prevention provides medical professionals, nutritionists, and researchers with an unprecedented reference for managing obesity.